Why international customers buy shoes & clothes online from Zappos USA? Need a pair of shoes or a new winter jacket, you can get all at Zappos USA online store. Zappos offers free shipping within US for all your purchases. Zappos.com is your one stop online shop for anything from shoes and clothing to handbags, accessories and even beauty products. You will find something for the entire family all with the click of a mouse from the comfort of your own home. Whether you are looking for a gift for yourself or that special someone in your life, Zappos.com will be sure to please. No need to deal with crowded shopping centers and driving all over town to find the perfect gift. With the ease and comfort of the U.S.A. based website it just makes sense to order from Zappos.com. Need your items to be shipped even sooner? Zappos.com has expedited shipping options with minimal domestic fees. Unfortunately Zappos.com does not ship internationally at this time. But USGoBuy.com helps international customers like you with this problem! That means you can have the above mentioned benefits, quick & free shipping within US, large selection of items available at affordable prices, customer friendly return policy! How USGoBuy helps with your Zappos onine shopping & international shopping? 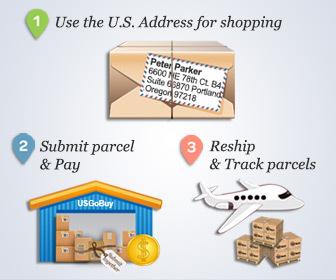 As we all know Zappos offers American customers with free shipping opportunities within USA, international customers can also take advantage of this by using the US forwarding address given by USGoBuy! Once your Zappos purchases have been shipped to USGoBuy warehouse, you will get informed. However, the Zappos package arrival at USGoBuy does not mean you have to let USGoBuy ship or forward them at once. You can wait for other packages to arrive in case you have ordered from eBay or Amazon or any other shopping site. If you have several packages, you can ask USGoBuy to repack or consolidate them with no charges! If you are ready to receive your packages from USA to your international address, simply submit a shipping request and you will have your Zappos purchase shipped via DHL or USPS at 60% off shipping rate.